(Nanowerk News) The School of Engineering at Cardiff University and Haydale have announced new research demonstrating significant improvements in mechanical performance including impact resistance in carbon fibre composites. These results, particularly the increased damage tolerance, could have significant implications for the development of future composite structures, demonstrating the potential in future aircraft design for weight saving and the consequent environmental benefits such as reductions in CO2 emissions. The research was undertaken by the Cardiff School of Engineering with additional funding from the European Community’s Seventh Framework programme under the Clean Sky Joint Technology Initiative. The Clean Sky Initiative is one of the largest existing European research programmes with the aim of accelerating technological advancements in aircraft design and green aviation technology. The project was based on requirements specified by the Centro Italiano Richerche Aerospaziale (CIRA) for developing new composite technologies for Green Regional Aircraft (GRA), and was managed by an integrated team from CIRA, Cardiff School of Engineering and Haydale. Effect of Haydale functionalised additions on mechanical performance of carbon fibre-epoxy composite. The research investigated graphene nanoplatelet (GNP) and carbon nanotube (CNT) reinforcement technology. Compared to a resin, a macro reinforcement such as carbon fibre is immensely stiff and strong, and hence in a fibre-reinforced composite, the properties are dominated by the fibre. The addition of functionalised graphene to neat resin has been shown to result in a doubling in stiffness, but the effect of this in a macrocomposite would normally be expected to be much less. The results observed in this research show a 13% increase in compression strength and a 50% increase in compression after impact performance, indicating that fracture mode has been positively influenced. 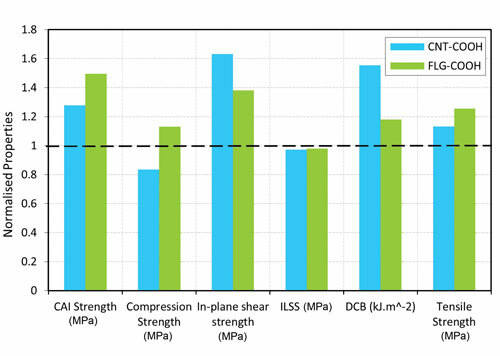 This is a significant result as damage resistance and compression properties are of paramount importance in high performance structures such as composite aircraft wings. A resin infusion technique was employed to produce composites containing a small percentage of nanomaterials, achieving maximum material improvements. This technique is used widely in aerospace and other high performance engineering industries for cost effective manufacture of high integrity materials. Significantly, the nanomaterials were surface treated using Haydale’s low temperature, low energy HDPlas® plasma process, which promotes homogenous dispersion and chemical bonding and avoids the waste streams produced by traditional functionalisation processes. The potential of graphene in developing a new generation of aerospace structures has taken a significant step forward as a result of the work carried out by Cardiff University. The research leading to these results has received funding from the European Community's Seventh Framework Programme (FP7/2007-2013) for the Clean Sky Joint Technology Initiative under grant agreement n° JTI-CS-2011-2-GRA-01-038. Haydale’s surface functionalisation of graphene via its low temperature plasma process has been critical in achieving the considerable material improvements observed in this research. The HDPlas® technique offers significant environmental benefits whilst exploiting the full potential of graphene in composites. Haydale are seeking commercial partners to further develop these highly promising results.